The LTUK web site provides information about and for organisations in the United Kingdom working with low (cryogenic) temperatures (generally below 77 K, which is -196 ° C). This includes university research groups, government labs, and industrial organisations, and covers areas as diverse as research into fundamental physics, the development and production of large cooled magnets for MRI scanners used in hospitals, and the design and construction of astronomical instruments used on the ground and in space. 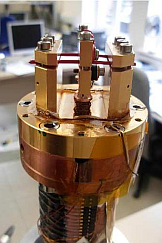 The web site is maintained by the committee of the Institute of Physics Low Temperature Group. Simon Prize: Information and past winners. Cryogenics: Information, documents and data on cryogenics.